Old School or High Tech? If you're going to make sausage, meat grinders are going to be high up on your equipment wish list. ...if you plan on more than a pound or two of sausage at a time ...you'll soon come to the conclusion that you need one of the dedicated sausage grinders. For well over a century, sausage makers have relied on simple hand cranked meat grinders like the one to the right. These work great, especially if your sausage batches are going to be on the small side...say 5 lbs. or under. They do take a little bit of manual labor, but have the advantage of not needing a separate power source. You can often find one of these older sausage grinders at rummage sales and flea markets, and many families have one that has been handed down over the generations. If they are taken care of they will last almost forever. Hand operated grinders are still being manufactured, and new models are inexpensive and easy to find at hardware stores and on specialty sites on the internet. A new one really shouldn't set you back much more that $50, and I have seen used ones on eBay sell for less than $20. If you buy a used hand grinder for your sausage making, be sure that it still has a selection of grinding plates included. You will want at least a fine (1/8 inch) and a coarse (1/4 inch) plate. With older grinders, it may be very hard to find replacement plates. If you think you are going to be making larger batches of sausage, or you want to invest in a grinder that takes a bit less work and is more modern, consider an electric sausage grinder like the one here. Electric grinders come in many different sizes. Some are designed for the home enthusiast and others are capable of grinding huge batches of meat (200+lbs. per hour). Expect to be charged according to the capacity and speed of the grinder...larger and faster will obviously be more expensive. The electric grinders I am most familiar with cost between $100 and $250 new. You could certainly spend more if you wanted to. I once belonged to a group of guys that got together once a year to make a large batch of venison sausage. We pooled our resources and bought an industrial grinder that cost well over $300, and we were never sorry for the purchase. Split between 6 families, the investment was reasonable...we made hundreds of lbs. of sausage each fall. For the single home kitchen though, it would have been over-kill. More Tips... Don't buy a used electric grinder unless it's from a source you really trust. They are more complicated than manual models so...more can go wrong with them. Also...make sure that any grinder you buy has metal working parts, either cast or stainless. Plastic is fine for the case, but you don't want plastic grinding plates or augers. 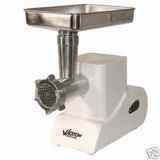 If you are lucky enough to already own a Kitchen Aid stand mixer, there is a great meat grinding attachment available for it. I bought one online for under $50, and it does a very good job. It's not quite as fast as a stand-alone grinder, but it is convenient and easy to use. I have also used a kitchen food processor for small batches when a dedicated grinder wasn't available. You do need to be careful though. Take it slowly and don't try to chop too much at once. It's very easy to over-process the meat and end up with mush. Meat grinders are important tools for sausage making. Choose the one that you think suits your budget and situation. Remember, if you start small you can always upgrade.